I’ve been thinking lately that I’d like to share with you, my dear readers, a look for work. After getting back from fashion weeks in New York, Vancouver, and San Francisco, I’ve been trying to catch up on a little interpreting lately, and so, here’s one of the outfits I’ve put together for just that. Keep in mind now that I work in a courthouse, and so, I don’t get to wear stylishly ripped jeans, mules, and a blazer. But I DID manage to sneak into the equation a pair of over-the-knee boots! This look was actually inspired by a trend I noticed in New York: attention-grabbing collars. I really like the pop of white against the black at the collar and sleeves. And I love combining black and white – it’s so elegant in its simplicity. 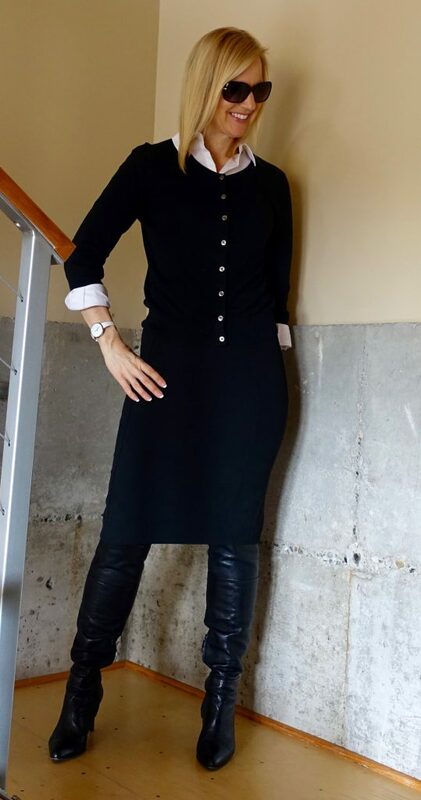 Since I have been feeling a little chilled by the change in temperatures, especially after returning to Seattle from the heat wave in California, I wanted to go with toasty boots – sort of a variation on the leather leggings look which I wouldn’t dare wear to work but love dearly. As you can see clearly in this last shot in which the sunlight highlights everything, I have a pear-shaped figure. Whenever I wear a below-the-knee pencil skirt, unless it is floating on me, it tends to pull a little horizontally; that is, unless I am standing with my legs straight after just having pulled the skirt down. This doesn’t bother me and seems to come with the territory of hips like mine. But, I wanted to mention that the white pops do a nice job of drawing attention away from the hips and add a little visual volume up top. If you are shaped differently, you can just as easily use white accents to “volumize” other areas. To keep things simple, this white watch I found at a design store in Palm Springs is a perfect accessory. I think that such a clean, neat look on top offsets any chance that my boots will remind someone at work of “Pretty Lady.” The boots themselves are also relatively tame, made of a beautiful, soft leather and a classic stiletto heel rather than an exaggeratedly high platform. Over-the-knee boots in suede can also be in the low-key range for wearing to work. Of course, while off-duty and especially while going out with Mark, I am happy to highlight the sexiness of the boots with a shorter-hemmed dress or skirt! Would you wear over-the-knee boots to work? Great outfit beautifully put together! Trendy and classy. I love how you made these boots work for work-also, genius title! OTK boots are my favorite shoe for this season. I have to get a pair like yours! My dear Janea, what a stunning and super classy look for work! It is so refreshing because it was a long time since I have seen work attire at a style blogger, especially now with the fashion week etc! You look amazing!! The white collar and sleeves layered are the perfect detail! Timeless, chic, stylish and a gorgeous classy woman wearing it! What’s not to love? Hope you are having a great Sunday my dear! You look so chic, with a touch of edge; the look is perfect for your job location! I just love how versatile OTK boots are, they really add a nice touch any outfit, as well as added warmth! Thanks so much for sharing, beauty, and I hope you’re having a great start to your week so far!